Even though Fortnite is a well-optimized game and can run on most low-end PCs, but if you have a really old system and want to get a playable experience, this post is for you. Also, if you want a good blend of graphics quality without compromising on the FPS, keep following this post and you’ll learn how to get the best gameplay experience in Fortnite. 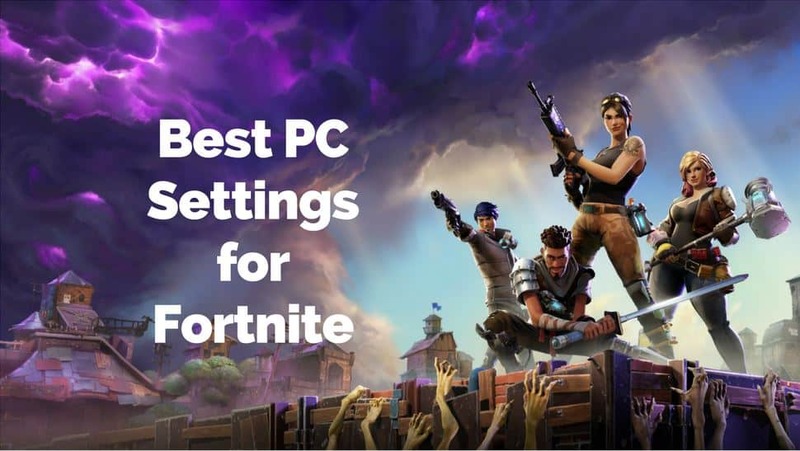 In this post, we will discuss some best Fortnite PC settings to boost the FPS and improve your gameplay. Most of the steps in this post will be only one-time, but you’ll have to keep your drivers updated and if you own a Laptop, make sure that the Power Mode is set to Best Performance every time you start the game. 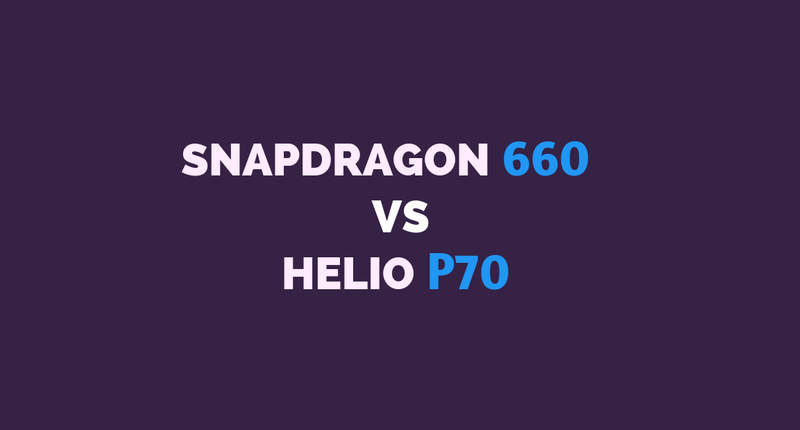 One more thing Notebook users need to keep in mind that when you’re not playing games, it will be better to select Integrated Graphics as the default graphics accelerator to save battery life. But while gaming, connect the power cord and switch the Default GPU to the dedicated one. 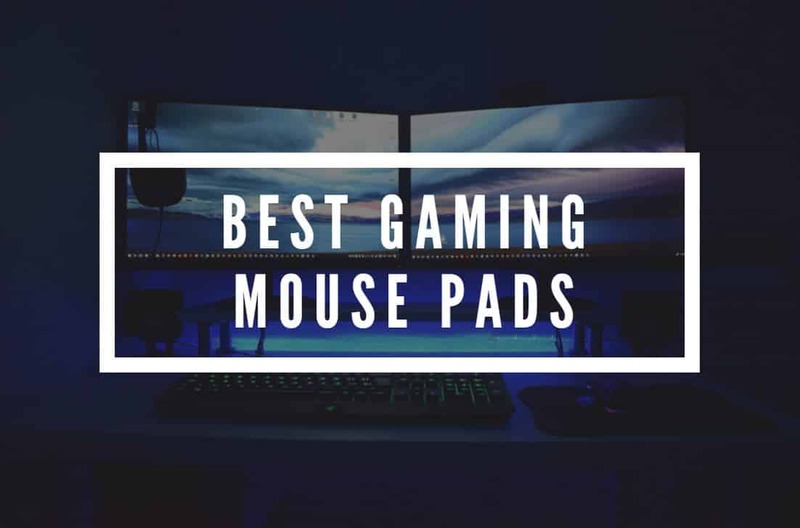 Looking for Best Mouse Sensitivity? 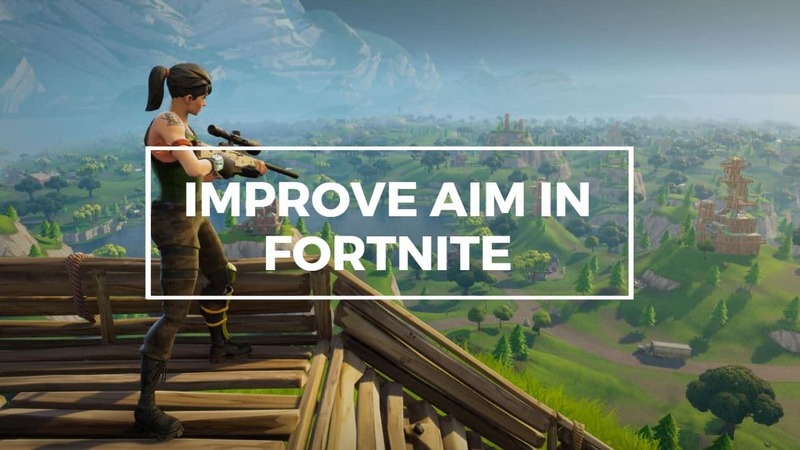 Check out our guide to Improve Aim in Fortnite. That guide also walks you through disabling mouse acceleration and ways to improve your aim. 6 Still Not Getting Playable FPS? 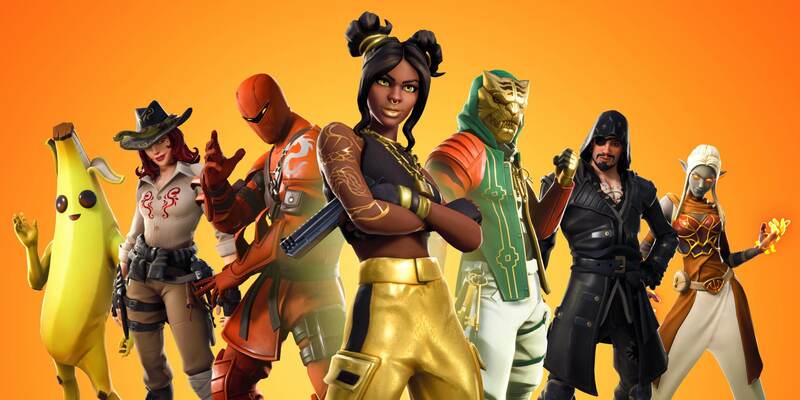 Before we choose the Optimal Fortnite PC Settings, updating the drivers is one important step that you should not miss. Make sure that you’re running the latest version of Windows 10. Yes, we all hate Windows Updates but to make sure we are running on the most stable and optimized version with latest driver support, keep the Windows updated to the latest version. Also, the Windows 10’s Creators Update introduced the Game Mode that can improve the gaming performance to a great extent. So, if you’re an older version, make sure to update. You can get the drivers for your Nvidia/AMD or the Integrated GPU from the OEMs website. If you don’t seem to find it there, get it from Nvidia’s or AMD’s official website. 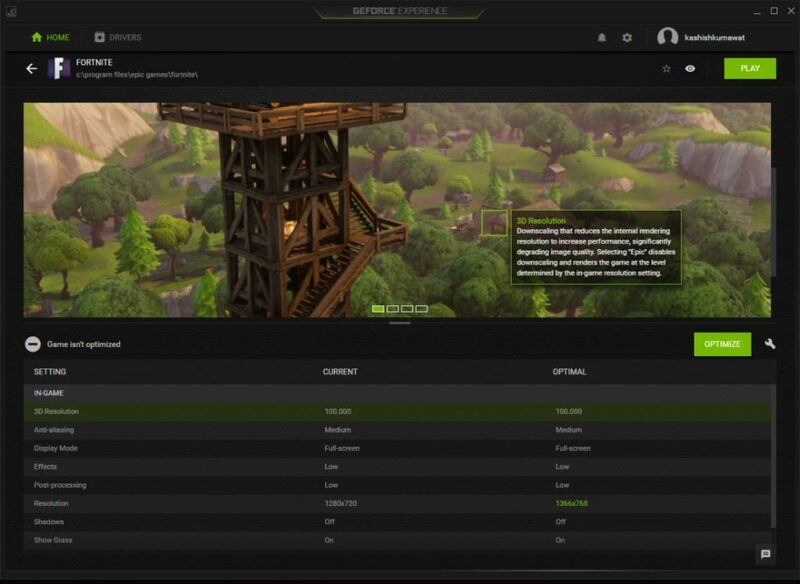 Make sure that you update the AMD Gaming Evolved Client and GeForce Experience Game Ready Drivers to get the optimized settings for Fortnite. The steps 1, 2 and 3 are only for Laptop Users, so the PC users can ignore them and move directly to the Step 4. If you’re using a Laptop, you shouldn’t be gaming without external power supply. If you have a dedicated GPU, then without external power, it won’t perform at its best. So, connect the power cord to your laptop and move to the next step. In the Windows Power Settings Icon on the Taskbar, change the Power Mode to Best Performance. If you are on a Laptop and it does have a dedicated Graphics card from Nvidia or AMD, then open the Control Panel and switch the default Graphics Processor to AMD/Nvidia instead of the Integrated one. 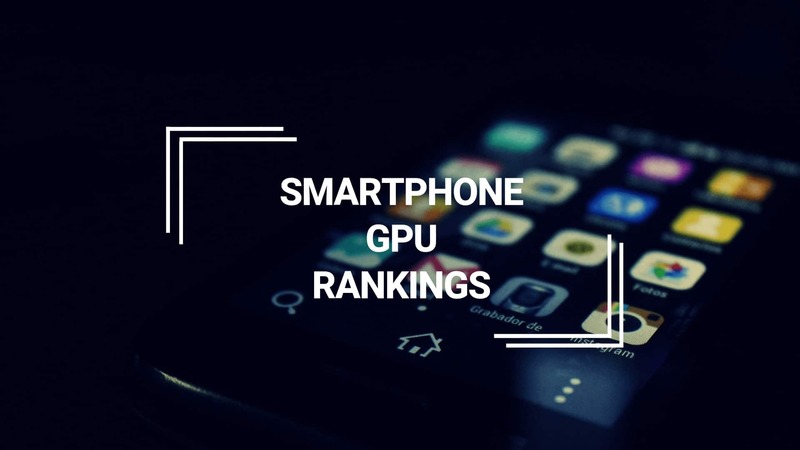 Though this step is optional as most systems will automatically switch to a dedicated GPU whenever you start a game or a graphics intensive program. 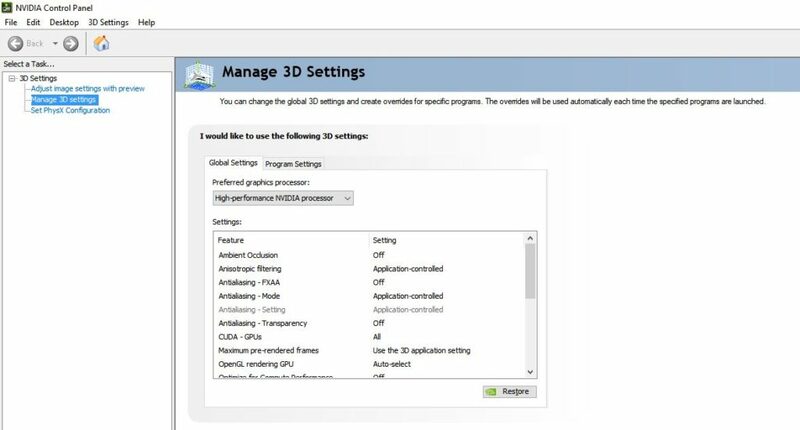 To do this on a Nvidia GPU, open the Nvidia Control Panel and select 3D Settings from the menu on the left. 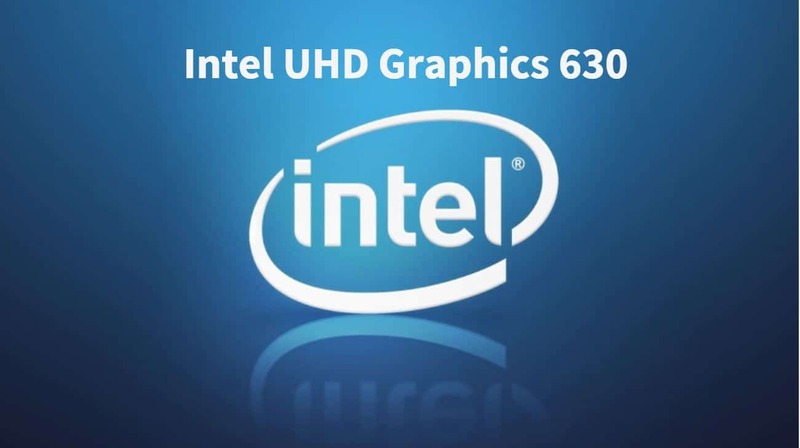 Now, in the Global Settings, change the Preferred Graphics Processor from Integrated Graphics to High-Performance Nvidia Processor. Now, your Nvidia control panel should like the one shown in the image below. Microsoft introduced the Game Mode in Windows 10 with the Creators Update. The Game Mode can significantly improve the performance of low-end systems. What this mode does is that it reduces background processes so as to allocate more hardware resources for the game. Here’s a step-by-step process to enable game mode in Fortnite. Simply launch Fortnite from the Epic Games Launcher. Now, wait for the game to load and then move on to the next step. To start the Windows Game Bar in Fortnite or in any other PC Game, just press the Windows Key and the ‘G’ Key. Pressing this Gear Icon will take you to the next menu. You only need to enable this option once. 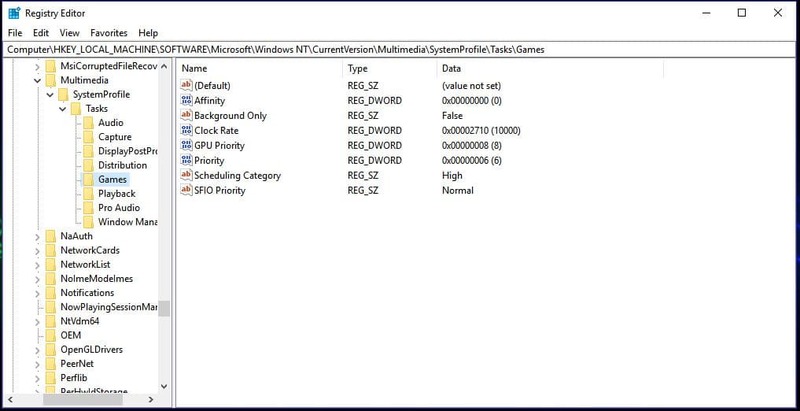 After enabling it, restart Fortnite and check if the Game Mode option in Windows Game Bar’s Settings is enabled or not. Most of the popular Anti-Virus or Security Softwares support a ‘Silent’ or ‘Game Mode’. The gaming mode disables alerts, background scanning, update or other processes that may affect your gaming experience. Some of the popular Security tools that come with this mode are Kaspersky, Avast, Bitdefender, and Norton. So, whenever you start playing a game, make sure to enable this mode. If your Anti-Virus doesn’t have a Gaming Mode or Silent Mode, I’ll recommend temporarily disabling it to get the best gaming performance. Press Win Key+ R to open Run and inside it, type regedit. 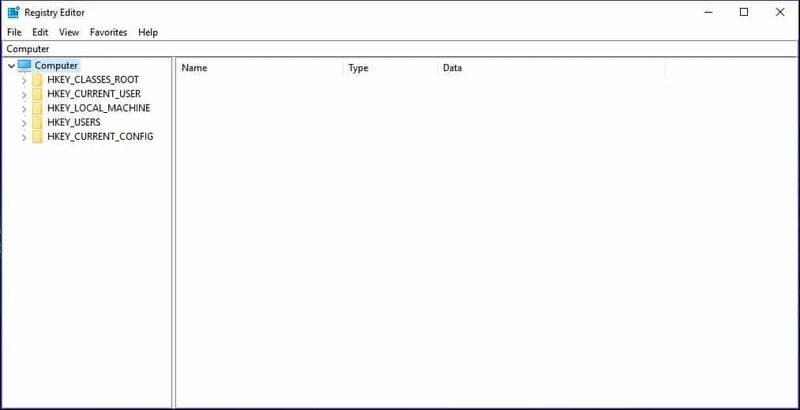 This will open the Windows Registry Editor. This should like the image shown below. Now, Double-Click on the HKEY_LOCAL_MACHINE. From the Dropdown, Double-Click on the Software. Scroll down to the list and Double-Click on the Microsoft. Again scroll down and look for Windows NT and double-click on it. Next, Double-Click on the Current Version. Scroll down one more time and look for Multimedia Folder. Inside, the Multimedia Folder, you will find SystemProfile. Single-click on the SystemProfile. Now, you should be on a screen like the one below. Now, Double-Click on the NetworkThrottlingIndex. 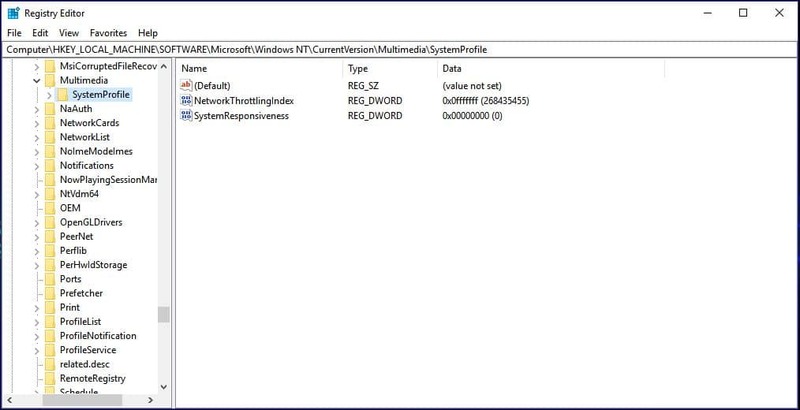 Inside Value date box, type 7 times f as shown in the image above. Or just copy fffffff and paste it there. In the Base Radio Button, select Hexadecimal. Now press OK.
Now Double Click on the SystemResponsiveness. 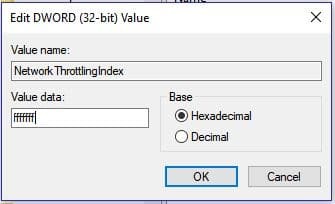 Type 0 (zero) in Value Data like shown in the image and ensure that the Base is Hexadecimal. Now Press OK.
Now, double-click on the SystemProfile on the left side menu. Then Double-click on Tasks and finally Double Click on Games. Now, you will be on the following screen. 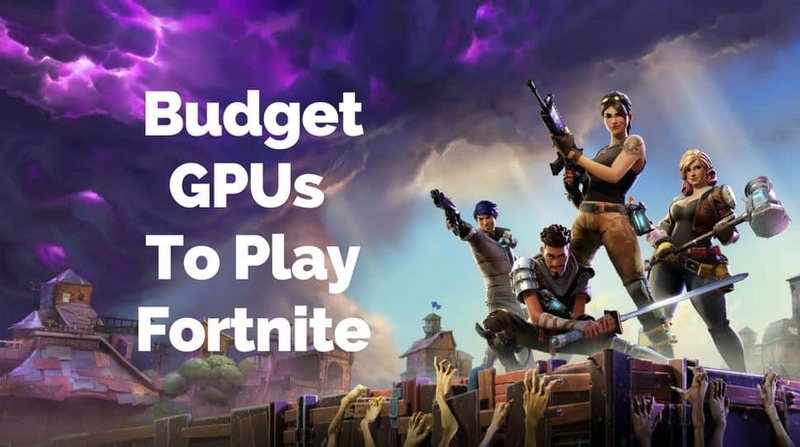 Double-Click on GPU Priority and set the Value Data to 8. Go the Priority and set the Value data to 6. In Scheduling Category, change the value data to High. Instead of manually selecting the settings, I’ll recommend optimizing it automatically using the latest Game Ready Drivers. Here are three separate sections for optimization depending on your GPU. 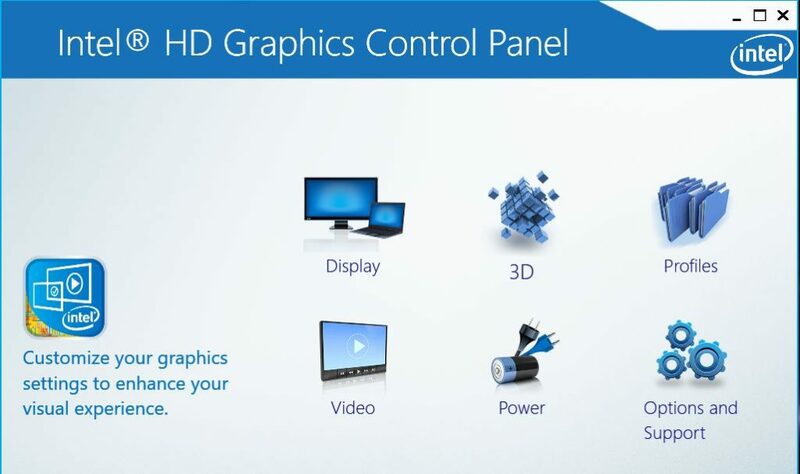 Open the Intel HD Graphics Control Panel and go to 3D Settings. In Global Settings, Enable the Application Optimal Mode. Now move to Application Settings. Set Conservative Morphological Anti-Aliasing to Override Application Settings. Select Use Application Default Setting for Vertical Sync and Turn Off Multi-Sample Anti-Aliasing. Now, Apply the Settings and press the back Button and go to Power Menu. For “On Plugged In“, choose Maximum Performance for Select a Graphics Power Plan. Once again, Apply the Settings and close the Intel Graphics Control panel. 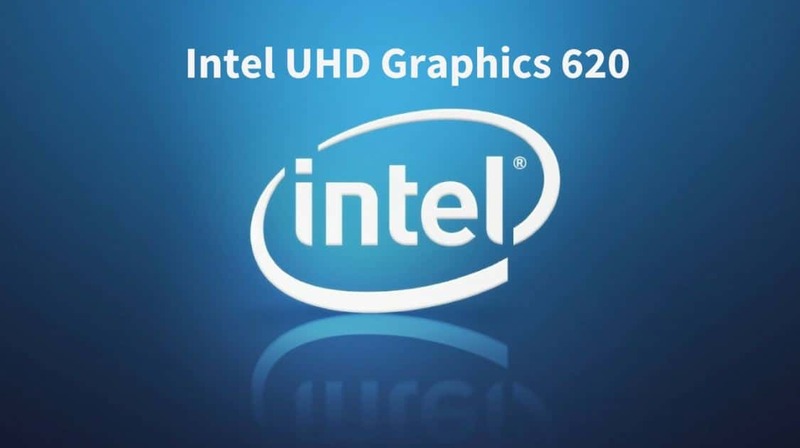 Now Follow this Guide to Improve the Performance of Intel HD Graphics. 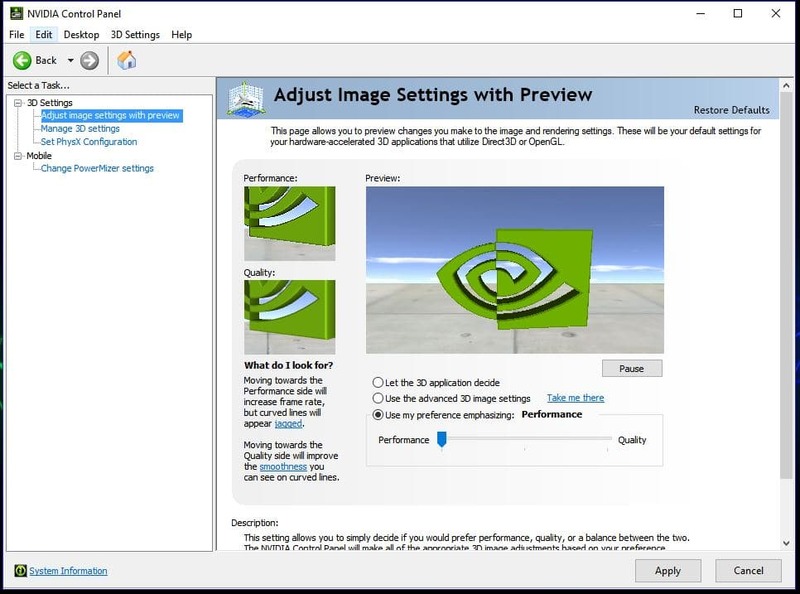 First up, Open the Nvidia Control Panel by right-clicking on your Desktop and Selecting Nvidia Control Panel. Inside the 3D Settings, go to Adjust Image Settings with Preview. Choose “Use my preference emphasizing” and drag the slider all the way to the left on the Performance. 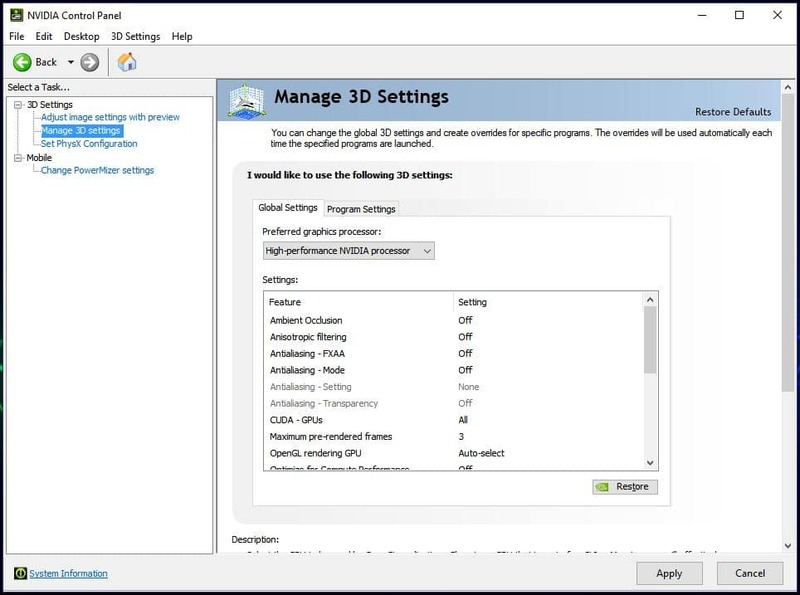 From the left tab inside 3D Settings, go to Manage 3D Settings. Make sure that you’re in the Global Settings. This screen should look like this. Now, make the following changes. Turn Off Ambient Occlusion, Anisotropic filtering, Antialiasing-FXAA, Antialiasing-Mode, Tripple Buffering, Vertical sync, and DSR-Factors. In the CUDA – GPUs, make sure that your GPU (or all the GPUs) are selected. Inside Maximum Pre Rendered Frames, Select 1 if you have a new/powerful GPU. Select 2 if your GPU is mid-range or just a few years old. Select 3 if your GPU is low-end. 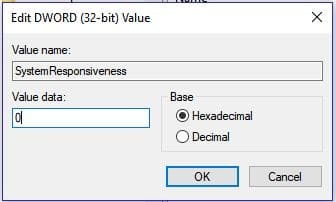 If your GPU is way too old and is struggling to run Fortnite, change the number to 4. Choosing 2 will be ideal for the most type of users. 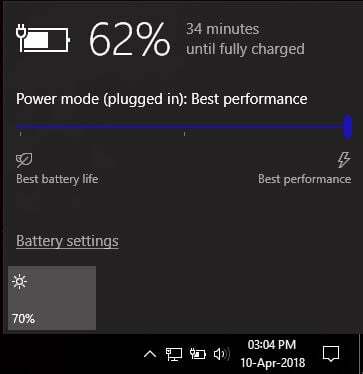 In Power Management Mode, select “Prefer maximum Performance”. Change Texture Filtering – Quality to “High Performance”. Now click on Apply and exit the Nvidia GeForce Control Panel. 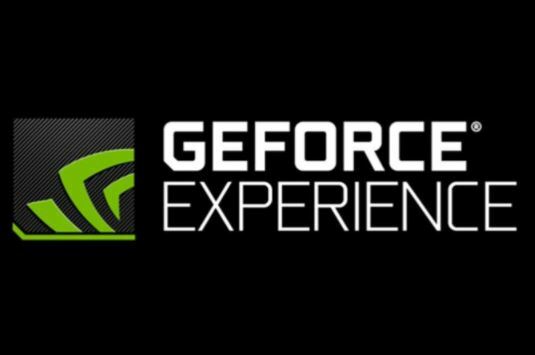 Now, Open GeForce Experience and go to Drivers. Just double check that you’re on the latest GeForce Game Experience Driver. Now, go back to the Games list in the present in the previous (Home) menu. From here, Select Fortnite. If Fortnite is not listed here, on the top-right of the screen, you’ll find three dots. Select it and press “Scan for Games“. In the Fortnite menu, Press the Optimize Button that is in the Green Color. Once it is done, press the Play button to start the game. You can, of course, change the In-Game Settings later but for now, let us keep it that way. For you, the Optimal Settings may not be the same as shown in the image above. 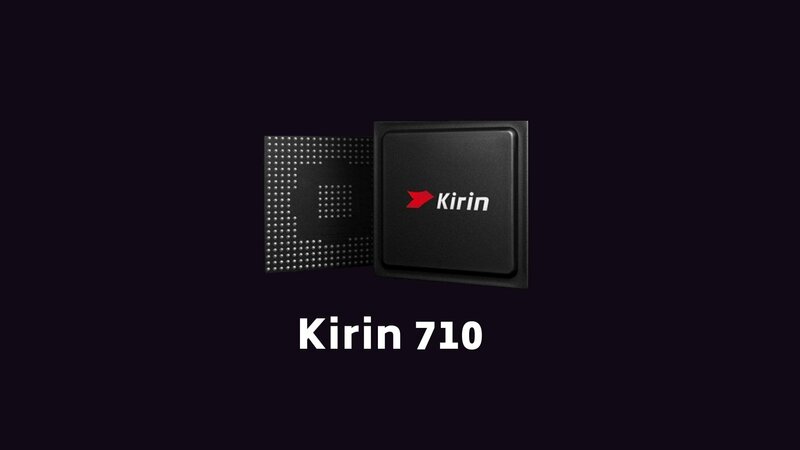 This will vary from GPU to GPU depending on its performance. 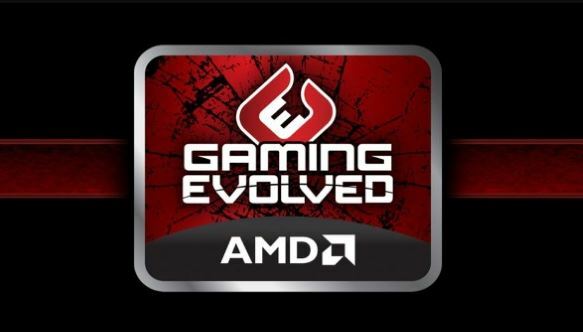 Just like Nvidia GeForce Experience, you can follow the same steps in AMD Gaming Evolved and optimize your game. Also, make sure that you’re on the latest drivers. After following all the previous steps, restart your PC once and start Fortnite. Check if the optimized settings have improved your gameplay or not. If everything is smooth, just enjoy the game and skip this section. 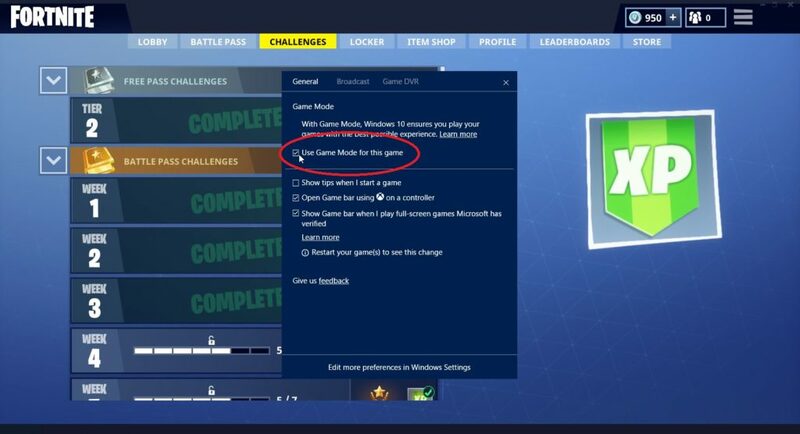 Otherwise, change your Fortnite PC Settings as shown below. In these Fortnite PC Settings that I have listed, you’ll observe that the resolution is set to 1280×720, and that is way too low. However, we will start from here and will gradually increase the settings to see how it impacts the FPS on your system. Now start the game and check the Frames Per Second and Visual Quality. If the FPS is still low, then decrease the 3D Resolution to 50% and check again. The 3D resolution can have a lot of impact both on the visual quality and the FPS. If everything performs great, go ahead and increase the Resolution to 1600×900 and change Effects and Post Processing to Medium. Once again, start the game and check for the FPS. If you’re still getting more than 60 FPS, feel free to change the resolution to 1920×1080. You can also increase the 3D Resolution accordingly. 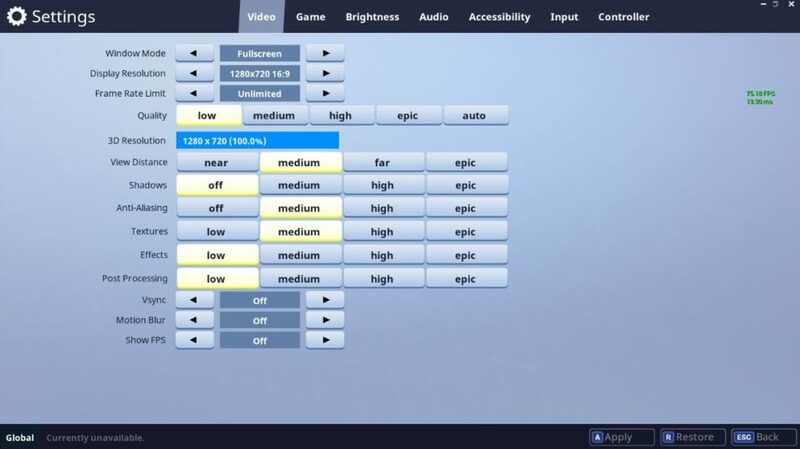 If you feel that it is further possible to increase the settings, change View Distance to “Far/Epic”, Shadows and Effects to “Medium”, and Textures to “High”. Now check the performance and if you find any significant drop in the performance, and decrease the settings. You’ll have to use a few hit and trials to achieve the perfect settings for your system, but this will be worth it as it is only a one time step. Want to know what Setting is used by Ninja? 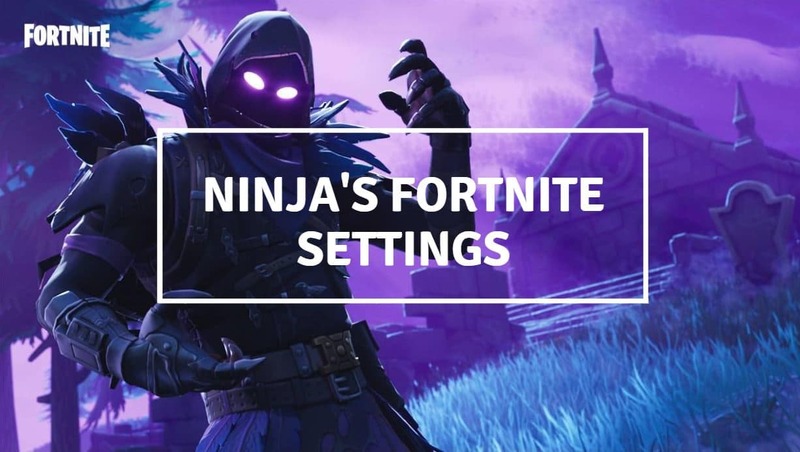 Check out: Ninja’s Fortnite Settings, Keybinds, and Gaming Gear. Here’s a gameplay of Fortnite on Medium Settings with the Nvidia GeForce 940MX Graphics Card. 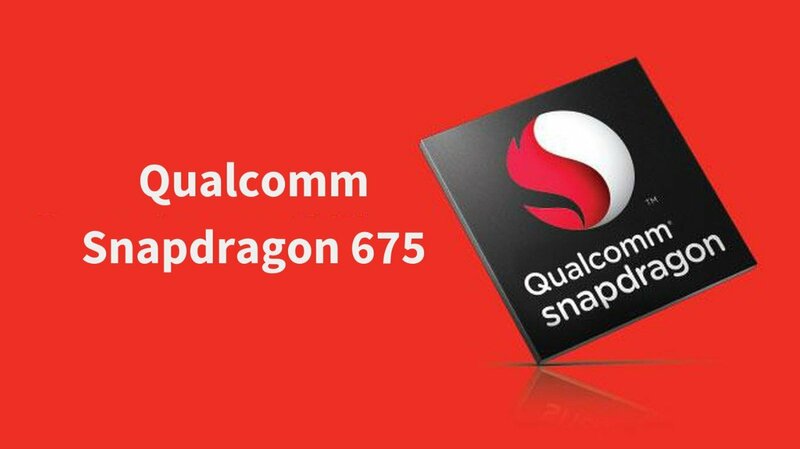 The other system specs in this video are Intel 7th Gen Core-i5 7200U Processor and 8GB DDR4 RAM. I know that I’m very bad at this game, but forget my gameplay and focus on the FPS that I managed to get with the above settings. Still Not Getting Playable FPS? If you’re still not satisfied by the performance of the game, you can overclock your GPU using the MSI Afterburner. However, I won’t recommend it just for playing Fortnite. If your system is not powerful enough to run Fortnite, I’ll recommend assembling a new PC instead. Or if you’re just looking for a new Graphics Card, you can grab the Nvidia GT 1030 for as low as $80. I do hope that these Fortnite PC Settings helped you to get a better FPS and performance. Do share this post if you found it useful. If you have any suggestions or queries, do share them in the comments section below. is fortnite free to play or we have to buy it like pubg Kashish? Fortnite: Battle Royale is free to play. Did you try changing the Window Mode from Windowed to Full Screen? The game for most persons does not support 1280*720. So i went to the setting file and changed it myself. I followed all of the possible steps for my PC and when I rebooted, always boots to a black screen. What’s going on? I don’t think that there is any step here that could have caused the same. Which version of Windows do you have? Does the black screen come after the Windows logo or after you Log in?